Umeda is a major commercial and business district in Kita Ward, Osaka, and the city's main northern railway terminus Osaka/Umeda Station﻿. 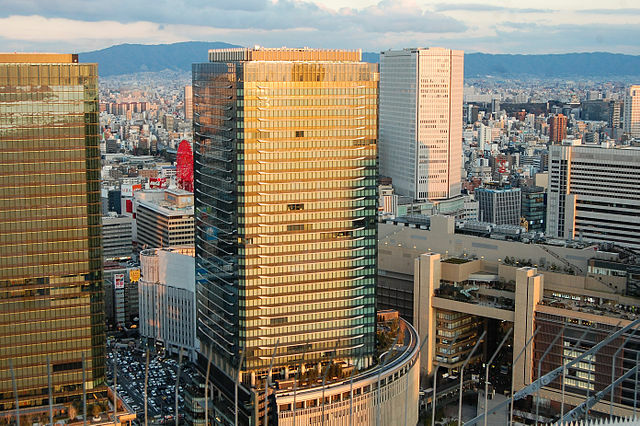 Besides being Osaka's busiest transportation hub the area is notable for its high concentration of tall buildings. It also offers an abundance of shopping, dining, lodging and entertainment services. The shopping heart of the neighborhood is located south of Osaka Station. 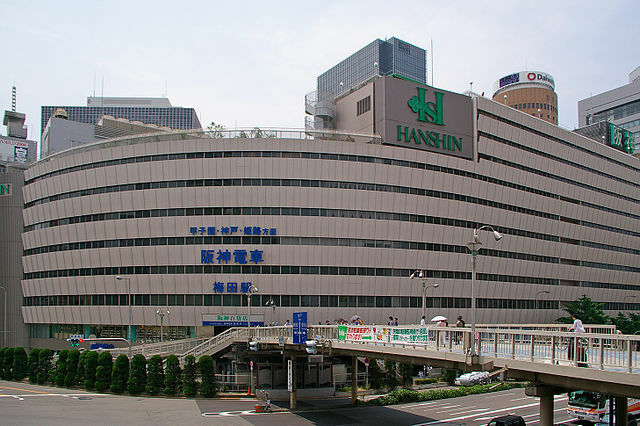 Four of the city's largest department stores - Hanshin, Hankyu, Daimaru, and Isetan, are located here, as well as many small shops and large shopping centers. 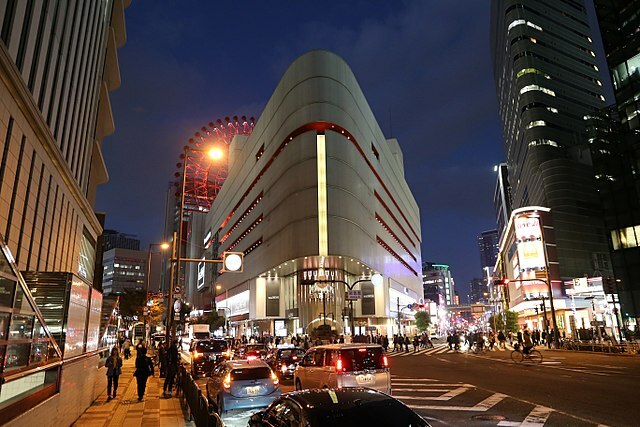 A branch of the electronics mega-store "Yodobashi Camera" is on the north of the station, as well as Grand Front Osaka a large commercial complex that was opened in 2013. 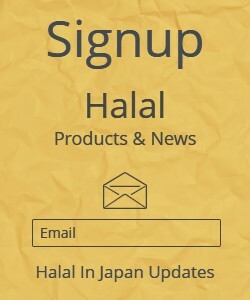 It consists of multiple, connected high rise buildings that offer a wide variety of shops and restaurants, offices, residential space, and small parks. 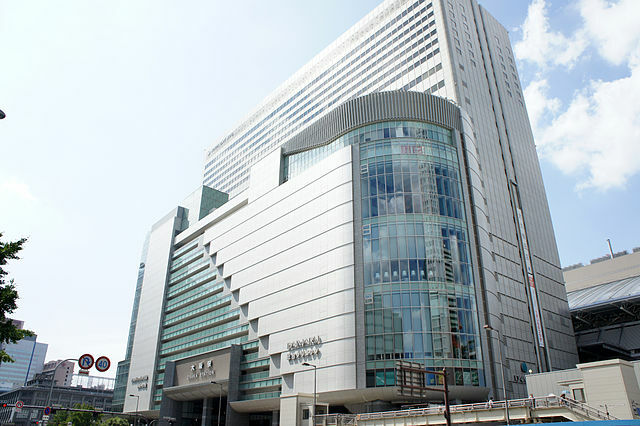 Hankyu Entertainment Park "HEP" is a major shopping mall and entertainment complex on the east of the Osaka Station, consisting of HEP FIVE and HEP NAVIO Buildings, housing over 100 shops, restaurants, an event hall and amusement facilities. HEP FIVE is known for its usual urban-center Red Ferris Wheel with the views of downtown buildings and Osaka Harbor. Inside, there are many shops for young people. NAVIO has distinguished Men’s fashion shops on each floor as well as a popular place for movies and gourmet. Shin Umeda City, the new urban center located northwest of JR Osaka Station is centering around the Umeda Sky Building. Umeda Sky Building is one of the city's most recognizable landmarks. It is a 10-15 minute walk from Osaka and Umeda Stations. It consists of two 40-story towers that connect at their two uppermost stories, with bridges equipped with escalators crossing the wide atrium-like space in the center. The spectacular 173 meters tall skyscraper features a Rooftop Observatory, the Floating Garden Observatory, as well as an underground market Takimi-koji that attempts to recreate the atmosphere of Osaka in the early 20th century. At the base of the towers is an urban garden with walking trails and water features. Kitashinchi is a dining and entertainment district located south and within walking distance of JR Osaka station, filled with thousands of small restaurants, bars and clubs. 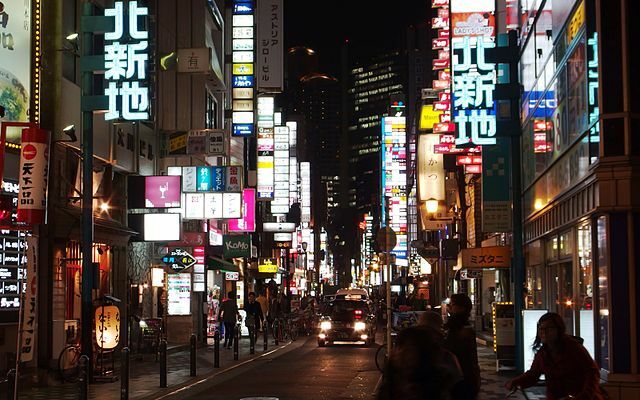 The narrow streets are brightly lit with flashing neon signs and billboards inviting customers inside. Business people go to Kitashinchi to entertain their clients, but many people go just for the fun. For those who find the newly developed dining areas of Osaka Station City and Grand Front Osaka a little too modern and sterile, Kitashinchi could be a good alternative. Hanshin Umeda Station "Hanshin Railways"
Higashi-Umeda Station "Tanimachi Subway Line"
Nishi-Umeda Station "Yotsubashi Subway Line"
Umeda Station "Midosuji Subway Line"
From Shin-Osaka Station – take Midosuji Subway Line "6 minutes". 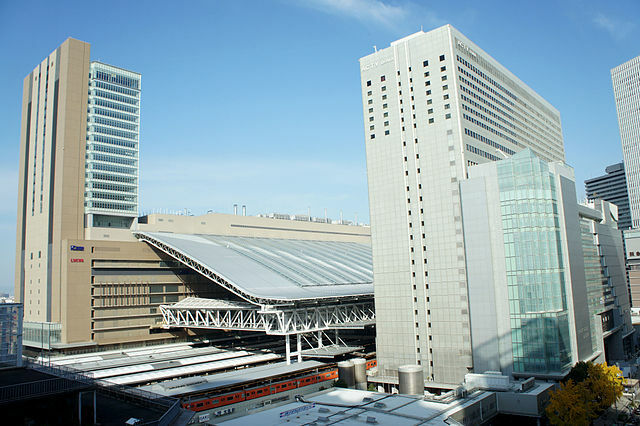 From Namba Station – take Midosuji Subway Line "8 minutes".